Speccyal K is Sinclair ZX Spectrum 48k & 128k emulator for the GamePark GP32 handheld console. - Virtual keyboard to enter any key and thus allowing a greater compatibility. It also allows entering the LOAD"" command on the basic command line to load the TAP file format. - Options screen with options to choose the joystick emulation (sinclair1, sinclair2, cursor), the emulated hardware ... Options can be saved on the SMC. - Savestates : press L + SELECT to save a game. The savestate will be automatically loaded the next time this game is selected. 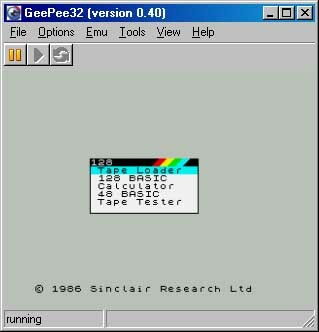 Put the roms (128-0.rom and 128-1.rom) and speccyal.fxe in \GPMM. The snapshots files can be anywhere on the SMC. 'J' (LOAD), then " and then ", and finally enter ('en' in the virtual keyboard).